Located in the heart of the Fanad Peninsula, with stunning views of Lough Swilly and the mouth of the Atlantic Ocean, Portsalon Golf Club sits at the base of Knockalla Mountain. 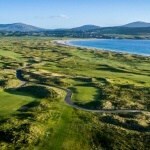 Portsalon was founded in 1891, as a founder member of the Golf Union of Ireland, the oldest golfing union in the world. 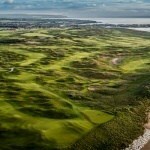 Today, it has progressed to become one of Ireland’s must-see Links courses. Redesigned by Pat Ruddy in 2000 to meet the modern challenge, Portsalon Golf Club is now working closely with Paul McGinley, Europe’s Ryder Cup-winning captain at Gleneagles in 2014, to undertake subtle but impressive changes to its layout. The result is that Portsalon consistently finds itself ranked inside the Top 25 of Golf Digest’s Top 100 Courses in Ireland. 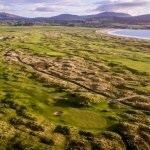 The Links at Portsalon is often referred to as one of golf’s ‘hidden gems’. The challenge at Portsalon is sure to satisfy golfers of all levels and abilities. A variety of shot making and imagination is required. Early in the round, visitors are treated to the majestic par-four 2nd hole – widely considered to be one of Ireland’s best golf holes. With the sureness of uncertainty that is the Irish climate, the only thing guaranteed at Portsalon is a warm welcome from staff and members alike and the promise that, once you’ve uncovered its charms, you’ll want to come back and try it again. When planning your golf vacation to Ireland, be sure that Portsalon Golf Club gets a deserved tick in the ‘must-see’ box. If you would like to play Portsalon Golf Club as part of your customized Irish Golf Tour, please contact us on Ph: +353 (0)91 868642 or Email: sales@northandwestcoastlinks.com . Check out some of our sample packages here.